Few! 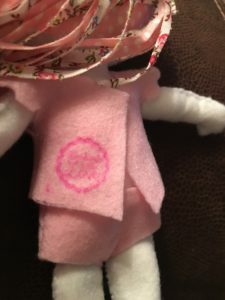 I finally finished my felt doll from Shelly Down’s book using adhesive fabric tape instead of wool yarn as suggested. It wasn’t difficult but it took a while because I did not have time (as you know I have a weekly job 9-5 ???? 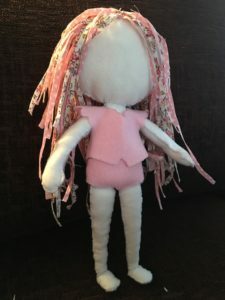 and I was thinking about how I was going to do the doll’s eyes and hair as I wanted it to be different. 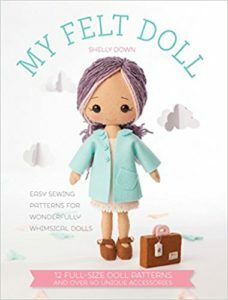 The book is amazing and so inspiring with all the patterns you need to make a beautiful felt doll. 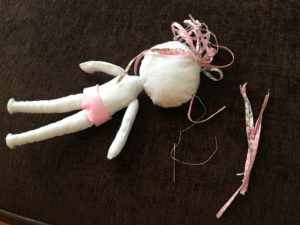 In this post I will show you how I made mine. For the body I just followed the instructions on the book. There are different types of felt: pure wool felt, wool blend felt, woven wool felt, acrylic and novelty printed felts. 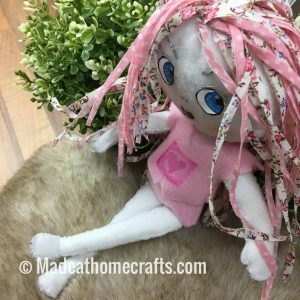 I used acrylic felt as it is the first time I am making a felt doll! but the choice is yours. A full list of materials is below. 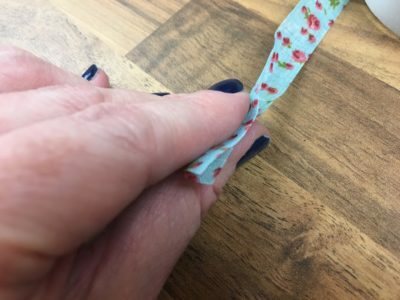 As you can see I did not use wool (yarn) as I decided to use a self adhesive fabric tape that I already had at home. I am a bit of a rebel, I know ????????.. I keep deviating from the instructions in Shelly Down’s book that says use wool! 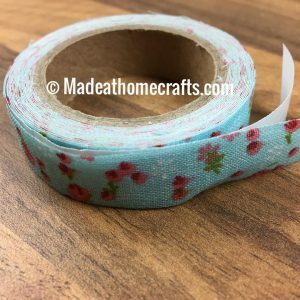 These fabric adhesive tape are one of the cutest thing I ever seen in the Arts & Crafts world. It is really up to our imagination what we can do with them! So I cut the lenght I wanted and folded. As the tape is adhesive I don’t need to sew and both sizes looks perfect! job done!???? Detail of the finishing clothes, I also used a stamp “Made with Love” ???? I think I am going to call her “Naughty”. She also seems to be a little suspicious… ???? 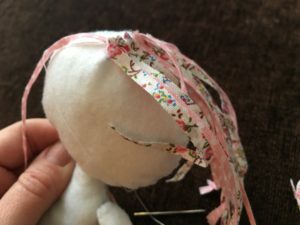 Well, I did not want to add safety eyes, I wanted to make my own, so as a fabric paint fan I decided to paint the eyes in a fabric and stick it in the doll’s face. So, use your imagination to make the eyes with felt, or safety eyes if you prefer. 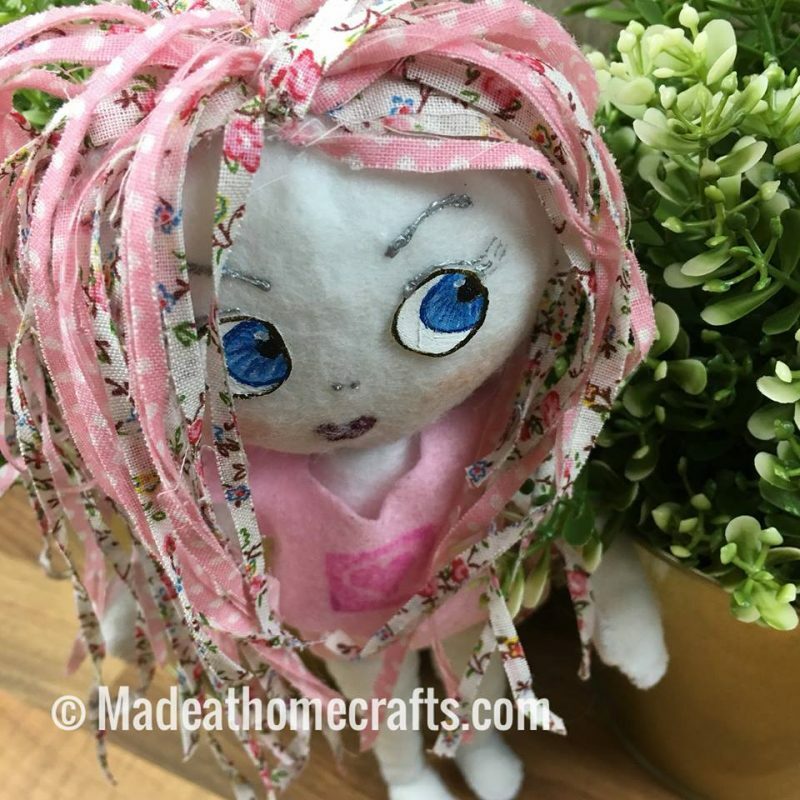 I really enjoyed making my felt doll from Shelly Down’s book. This post contains affiliate links which mean we might take a teeny bit of commission for recommending these things to you. There’s no markup or extra cost to you, it’s just a way to help support our blog. The links save you the time of hunting for things yourself. If you don’t want to clink the links, we wont’ make you! – feel free to just Google. the choice is yours! ??? ?